Bella enjoying her PupSaver inside the house. 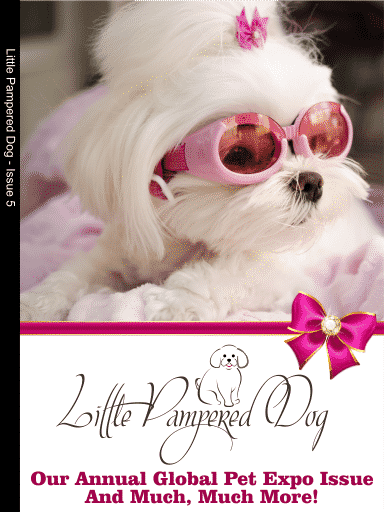 We attend Global Pet Expo, the pet industry’s largest annual trade show each year in search of the best products for our (yours and mine) Little Pampered Dogs. Each year we recognize our picks for “Best in Show!” In this episode we interviewed Ashleigh Bennett of PupSaver. PupSaver is the crash tested car seat made specifically for little dogs. What first caught my eye was how posh and decadent the car seats looked and felt. But the PupSaver’s good looks and comfort is only half of the story. The PupSaver is crash tested and invented with the intention to keep dogs as safe as possible in the event of a crash or short stop. In this podcast interview you’ll learn all about PupSaver and how Ashleigh’s father, Ray Bennett, invented it. You’ll also learn how Gizmo, Ray’s dog, is the muse behind this product. The best of the best in technology have gone into this product. With PupSaver, they have touched all of the bases, the product is beautiful, functional and, frankly, very needed. I was able to get Bella (my personal Little Pampered Dog) used to the PupSaver by bringing it inside and letting her relax and play on it. We call it her “couch” and now when we tell her to go to her couch she runs to her PupSaver! It’s so cute! So when I put her in the car ( I install the PupSaver first, of course) I tell her “go to your couch.” She’s used to it as “her couch” so she’s very happy riding in it! The full article on PupSaver can be found in Issue 5 of Little Pampered Dog but you can listen to the complete interview here. Our other two picks from Global Pet Expo are included in the extended Global Pet Expo section. Plus there’s so much more in the issue! You can access it by downloading the free app and then purchasing Issue #5. For more information on PupSaver specifically or to make a purchase you can go to the PupSaver website here and/or purchase your PupSaver from our boutique here. Issue 5 – Global Pet Expo 2014 and much, much more! Please note that simply by downloading the app you’ll receive Issue 2 as our gift to you. Even though that issue doesn’t have the PupSaver article, it does contain several other stories that I know you’ll love including an interview with Kelly Costello, owner of Puppy Cake and as seen on Shark Tank!